OK, so I said I'd get back to more images of Haworthias. I will; I really will. 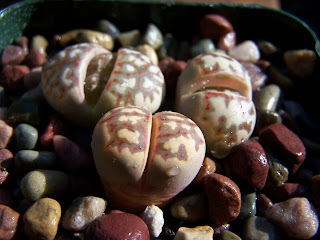 But I just couldn't resist posting this closeup photo of a Lithops seedling...Lithops optica ssp. rubra. Years ago we bought a bunch of these in California and on the way home in our trusty old VW camper we decided to camp out in central Oregon, which is high desert country. When we came back from a long hike we found all the "rubras" had been eaten by chipmunks. Mind you, none of the other Lithops...just the optica rubras! That's a true story. And one more reason we like these critters so much...the Lithops, that is. And yes, we still like chipmunks. They're cute little critters too. "It looks to me like they shave these animals..."
I'll be back tonight or tomorrow with some more Haworthias! I have a few moments before heading off to the fair so -- another photo. This time it's one of the more valuable plants we have: Haworthia magnifica var. splendens. These are seed grown plants (GM452) and they aren't for sale yet. As they reach maturity they develop a beautiful patina - a kind of porcelain glaze - on the leaf surface which is just amazing. These plants were so much in demand that it had the potential of placing habitat at risk. However, with the increasing availability of seed grown plants (in this case with seed collected on site), the values have come down from many hundreds of dollars per plant to still expensive but less so, reducing the incentive to collect the plants from the wild. I'll try to post on the next couple of days but I may not have time. I'll be attending the horse show and other stuff at the Oregon State Fair and will probably be a bit tired by the time I get home. But, you needed a break from all these Haworthias anyway, didn't you? The answer to "How do I get my cactus to flower?" OK, it's time for an intermission from all the Haworthias. This is a Copiapoa laui which hasn't yet established any roots. And you were asking how to get them to flower? Today's Haworthia is Haworthia turgida var. suberecta. This is a highly variable species but this is one of my favorites. Continuing with haworthias: Some haworthias grow flat to the ground, exposing only their upper surface, while others form lovely hard-bodied clumps like this Haworthia nigra. Oringinally described as an Astroloba, H. nigra can be quite variable in color and form and are fairly easy to grow and reproduce as it is usually slowly proliferous or stoloniferous. Beautiful plants. 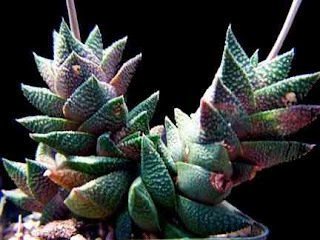 The leaf surface of an Haworthia may be smooth and shiny or it may rough and bumpy. H. koelmaniorum is certainly an example of the latter. In our experience it's slow growing and reticent to develop offsets. Therefore it's not that available through nurseries, including our own (though we do have a couple available currently). As with fans of Lithops, those of us who enjoy Haworthias will often be seen with a magnifying glass admiring the intricacies of their form. Today's Haworthia is another stocky plant which has a nice dark green color and makes a very impressive display: Haworthia mutica var. nigra. Today's Haworthia is very different than yesterday's. H. lockwoodii grows in very dry areas and the tips normally dry back. In extreme drought, the whitened leaf ends close around the plant. The markings on these plants are quite distinctive from plant to plant. Exquisite. Since my last post was a "medley" of Echinopsis flowers, I couldn't resist another grouping. Sometimes I'm just wandering the greenhouses and a certain combination just strikes out at me. This is one of those cases. I couldn't have planned it better myself. Today was one of those days when they all come together. Three Echinopsis hybrids decided to flower all at once: Paramount Rose, Stars & Stripes and Buttercup. 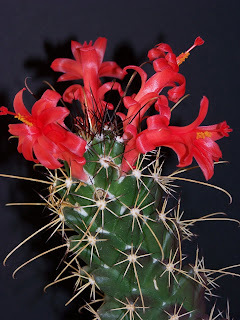 This is a photo from the Oregon Cactus & Succulent sale and show in July. This is one of my favorite Lithops. The markings are just amazing, especially in the sun after a good rain. I love the flowers on this plant. It makes for a very striking specimen.